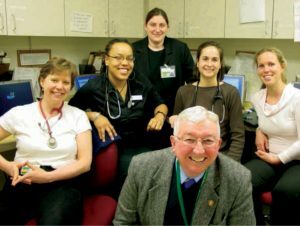 Clinic Staff At Outside In (Left To Right) Student Diana Henson; Dr. Kimberly Tippens; Dr. Michelle Salob; student Cora Rivard; student Lindsay Millin Fontenot; then NCNM President Bill Keppler in 2005. From the earliest days of the NCNM clinics, invaluable real-world experience for naturopathic and Chinese medicine students has gone hand-in-hand with helping the vulnerable and poor get better through free or low-cost care. Dr. Laurent Chaix, a 1995 graduate of NCNM’s naturopathic medicine doctoral program, was a resident in one of the first community clinics. Working with Chris Meletis, ND (’92), and others, he helped set up a series of NCNM clinics at Portland Community College (PCC) sites, downtown Portland’s Outside In and several other sites, including the community clinic at Mt. Olivet Church in Northeast Portland. That latter clinic, recalls Dr. Chaix, was formed in 1995 after NCNM’s African-American students approached the church pastor. Soon, NCNM students and faculty were visiting the church each week, initially setting up partitions and massage tables near the pastor’s office. Other nearby rooms served as exam rooms. Using Mt. Olivet as a model, NCNM set up its first PCC clinic at the community college’s Portland Metropolitan Workforce Training Center in Northeast Portland, according to Chaix. NCNM students have similarly benefited with experiences at the other clinics, whether it was PCC students or the African-American community. NCNM community clinics since have broadened their reach and now also include the Asian and transgender communities, and with the addition of the Beaverton Clinic (see Beaverton Clinic, p. 18), NCNM is seeing increasing numbers of Spanish-speaking patients. Chaix sees positives and negatives with the changing medical landscape. The Affordable Care Act has cut community clinic numbers because now more people are covered by insurance, he said, but there are more opportunities to help the uninsured in the Hispanic community. Whatever happens, Chaix remains a strong advocate of the teaching and healing opportunities the clinics provide. “Most of the students that choose NCNM do so based on the reputation we have that our clinical training is awesome, in great part due to the community clinics,” he said. Learn more about NCNM’s Community Clinics.